Non-removable bridges replace a missing tooth or teeth with artificial teeth. A missing tooth can be replaced by spanning one healthy tooth to another healthy tooth with the replacement tooth between. By having a bridge placed you will notice a great difference in your appearance, chewing, and speaking. 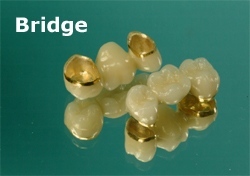 Depending on placement, our bridges are fabricated from porcelain fused to high noble metal, gold, or all porcelain. All non-removable bridges are permanently cemented.